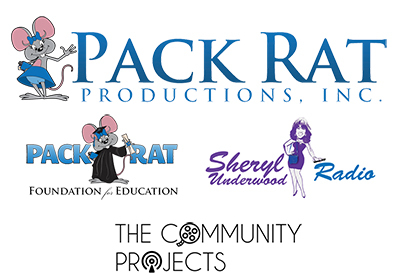 Sheryl Underwood Radio (SUR), Pack Rat Foundation For Education (PRFFE) and Marcus King (King Artist Entertainment) are working together to bring visibility to the efforts of Aaron Frank (THE COMMUNITY PROJECTS) and Charles “Bear” Spratley (BROTHERS AGAINST BANGING YOUTHS (“BABY”), a 501(c)(3). Aaron Frank’s organization, THE COMMUNITY PROJECTS, teaches youth creative and media production skills and Charles “Bear” Spratley, at BROTHERS AGAINST BANGING YOUTHS (“BABY”), is an ex-gang member that works to give youth positive alternatives to gangs through sports, dance, positive self esteem and other outlets, like the options for film and radio production offered by THE COMMUNITY PROJECTS. Sheryl Underwood Radio will broadcast LIVE FROM WATTS in recognition of Martin Luther King, Jr.’s Birthday, and will shine a light on the work of Franks and Spratley. THE COMMUNITY PROJECTS offers at-risk youth the opportunity to learn practical film and radio productions skills. The live broadcast will take place at Colonel Leon Washington Recreation Center in the Watts neighborhood of Los Angles, CA on January 14, 2017. The stories of South LA communities, produced by participating youth, will be brought to life through the mediums of film and radio and be distributed to audiences throughout Los Angeles and around the United States. By the end of each program, the youth will have produced numerous final films that they will showcase at a final screening event held for the community, family and friends. Sheryl Underwood, creator and host of Sheryl Underwood Radio and co-host of the Emmy award winning show THE TALK on CBS television, is committed to using her influence and visibility to improve the lives of people, especially youth, by shining the spotlight on initiatives like THE COMMUNITY PROJECTS and BROTHERS AGAINST BANGING YOUTHS (BABY). Underwood is also the 23rd International President of Zeta Phi Beta Sorority, Inc. and founder of Pack Rat Foundation For Education, Inc., a 501(c) (3) organization established to raise funds and awareness for Historically Black Colleges and Universities and support the dream of a higher education for deserving students. The LIVE FROM WATTS broadcast will be heard on the 73 Sheryl Underwood Radio affiliates nationwide and will have a reach of over 5 million listeners. Sheryl Underwood will be appearing live at the JSpot in Los Angeles January 12-15. Mike Washington, host of the “”WOW Show”” on Sheryl Underwood Radio, will be performing at the J-Spot with Underwood. Sheryl participates in the Kingdom Day Parade, Monday, January 16 in Los Angeles. Funny-man J. Anthony Brown will be guest hosting a week of shows for Sheryl Underwood Radio. Sheryl Underwood Radio is the third large syndicated radio show, airing daily on 73 Radio Affiliates across the United States and in the Virgin Islands. The crew of Sheryl Underwood Radio is Sheryl Underwood, co-host of THE TALK on CBS, entertainer, philanthropist and 23rd International President of Zeta Phi Beta Sorority, Inc., and a cast of seasoned radio and entertainment veterans – Harry Southerland (Our Country Lawyer aka “Judge Harry”), James Kelley (The White Jim Kelley) and Executive Producer (Super Producer) Vic Frost. Sheryl Underwood Radio is smart, and speaks to the issues and interest of the Urban (18-34) and Urban Adult Contemporary (25-54) listener. The show is relevant, tackling the hot topics of the day in a snappy, engaging, informative format. Sheryl and the crew provide energetic conversation about relationships, entertainment, sports and culture. For more information on the LIVE FROM WATTS broadcast call 1-855-Sheryl 1. To learn more about THE COMMUNITY PROJECTS call (818) 569-9678 or email AaronMWFrank@gmail.com.